Will Spike TV Spike Reality Show “DEA”? 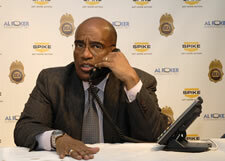 WASHINGTON — NBC weatherman Al Roker predicts the weather, but his production company, which produces the reality TV show “DEA”, has been reluctant to predict whether there will be a third season for the program featured on Spike TV. By most accounts, the forecast for a third season looks doubtful. The show, which helped boost the profile of the agency and interest from prospective recruits, last aired on March 31, 2009, more than a year ago. Both seasons featured agents in gritty, high-crime cities; the first year in Detroit, the second in Newark. Debra Fazio, a spokeswoman for Spike TV, told ticklethewire.com “no decision has been made yet about a 3rd season.” And Tom Chiodo, a spokesman for Al Roker Entertainment Inc., the producer of the show, echoed similar sentiments, saying he was uncertain as well. The show, which followed DEA agents and task force members around as they busted down doors, made arrests and gathered info from informants, played to mixed reviews inside and outside the agency. On the upside, it gave the DEA, which is too often overshadowed by the FBI, a higher profile and helped boost recruiting. But critics who were protective of the DEA image thought the show failed to provide a broader picture of some of the agents’ duties — namely working bigger, longer-term cases. In part, agents had to focus primarily on smaller buy-bust cases because the Justice Department had forbidden any cases exposed on TV to be taken into federal court. Consequently, those cases on TV had to go to state court. Some agents were also uncomfortable airing the inner workings of the DEA and seeing informants talk on TV, even if their faces were blurred. Critic Neil Genzlinger of the New York Times was none too impressed with the show when het wrote about it on April 2, 2008. “The program, somewhat incongruously, is produced by Al Roker Entertainment — yes, the jolly weatherman — and that’s about the most interesting thing to be said about it,” he wrote. The show “DEA” premiered on Spike TV in April of 2008 and immediately pulled in solid ratings and a barrage of mostly positive publicity for the agency. The first season of “DEA” — six hour-long episodes that featured agents from Detroit’s DEA divison — aired in April and May of 2008. 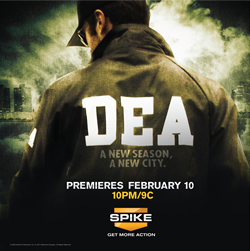 A little more than five months later, Spike TV announced that a second season of “DEA” was being picked up. The second season — nine hour-long episodes that showcased DEA agents based out of Newark, NJ — aired between February and March of last year. In the first season, the program averaged between 1.2 and 1.3 million viewers over the course of its half-dozen Detroit episodes, giving the network a 132% increase in viewership in its time slot. In the second season, the ratings dropped only slightly to about 1.1 million viewers per episode. Admittedly, he said, it’s part of the DEA’s mission to work with local law enforcement tasks forces on smaller cases that impact the community. The first two seasons featured agents in cities that were constantly battling a negative image in the national media. The marketing campaign for the second season infuriated quite a few New Jersey politicians by calling Newark “one of America’s most dangerous cities” in radio advertisements that were pulled before they hit the air. At the same time, the show created a surge of positive publicity for the agency. The DEA credited the first season with generating more than 13 million hits on its website and helped recruiting nationwide. In fact, the New Jersey DEA office had the opportunity to watch the first episode of Season Two a few days before it aired. Once the episode concluded, he said, the entire room of 150 rose and delivered a standing ovation. Of course, shows featuring the DEA will not end even if “DEA” does. One of the central fictional characters on AMC’s popular drama “Breaking Bad” is a DEA agent, the pugnacious, pot-bellied Hank Schrader. And strangely enough, if “DEA” gets spiked, it would not be the first time a TV show entitled “DEA” was killed off. In 1991, Fox canceled a police drama by the same name after 13 episodes. Posted: 6/16/10 at 6:28 PM under FBI, News Story, Special Report.